Nurturing your prospects in your email list is crucial to building stronger relationships and trust. Watch this quick video to learn 3 quick tips to help you along. Hi there. Do you ever wonder how to get more engagement from your eList plus get more conversions? It’s actually easier than you think. 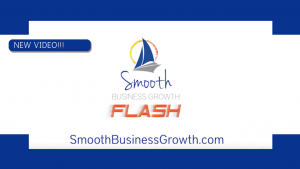 This is Smooth Business Growth Flash Update. I’m Lyndsay Phillips. If you’re sending out emails to your list, but wonder why you may not be getting as many replies, engagement, clicks or conversions, then maybe you’re missing the really important step of nurturing your list. So nurturing is crucial to building trust, building a relationship with your prospect. I mean, think about it. Do you really want to come off as a used car salesmen tracking into your list with the lead magnet and then going for the sale, whether it’s a webinar, product or event promotions? Heck no! So how do you nurture them? Here are three quick ways. 1. SERVE – Send them content, tips, strategies, whether it’s a video, a podcast, an article, quick tip, they’ll interact and see you as the expert and trust you. 3. BE FUN – You don’t have to be serious all the time. Send updates on what’s going on with you, your business, inject some personality and fun into your communications. They want to know the person behind the business. Of course, we at Smooth Sailing Business Growth, do that for our clients. We help them attract and convert customers faster with email marketing, sales funnels, and content marketing in general. So if you want to learn more, head to SmoothBusinessGrowth.com. There’s even a free social media roadmap for you to get consistent with your social media with less overwhelm and more online exposure. and may the winds always be at your back. Helping entrepreneurs attract & convert more customers faster with powerful content marketing. Tags: clicks, conversions, engagements, nurture clients, nurture list, nurture prospects, and relationships.